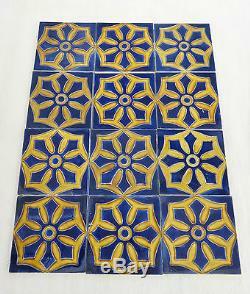 A Gorgeous Set of Twelve Antique French Tiles by Boulenger, Choisy-Le-Roi. 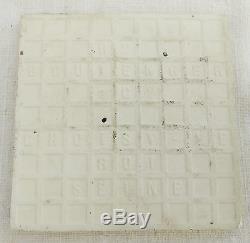 Plus Surround Tiles For Projects. 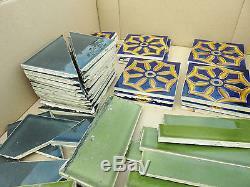 A wonderful set of twelve antique French tiles dating to 1880. Boulenger in Choisy Le Roi. This company was created in the early 1800's and closed in 1938. 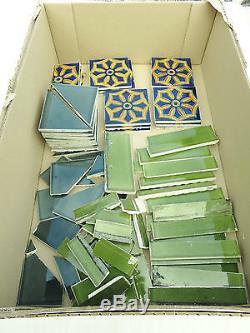 These tiles are from the beautiful Bordeaux home of a viscount, the property was built in 1880 and its fireplaces were installed at that time. 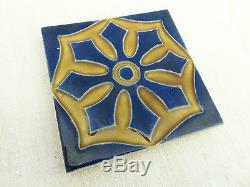 These gorgeous blue tiles with yellow ochre centres once graced a fire place in the salon of the property. If you take a look at the final photo you will see how they were originally displayed. The ensemble would create a wonderful period feature in your home and can be displayed in a multitude of ways. Please view my other listings to see other gorgeous items from long ago France. 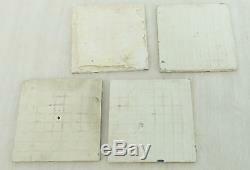 In good general used antique condition with a patina of time and wear as seen in the images. Looking very old and crazed, as can be seen by zooming in on all the photos. 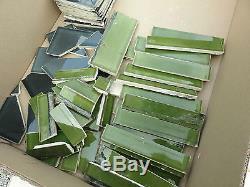 Some of the tiles require cleaning. There are four half blue tiles (in addition to the 12 whole ones). 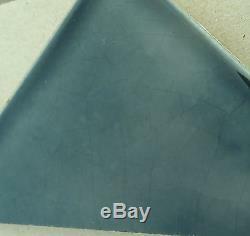 The surround tiles are in used condition and some are broken and chipped as can be seen in the photos. As some pieces could be missing or broken. 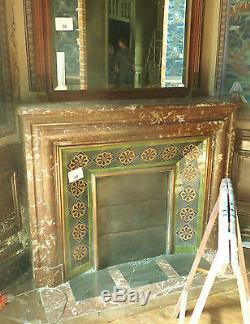 The red marble fireplace and the floor tiles are not part of the sale. 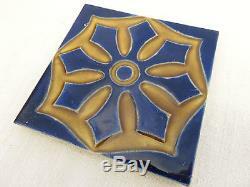 Each of the blue tiles measures 10 x 10 cm (4 x 4 inches). I adore French antique clothing, decoration, lighting and jewellery and try to have a varied selection of these items available in my listings. Please take a look at my other items and you'll discover a world of French treasures. Merci de votre visite -Thanks for your visit! 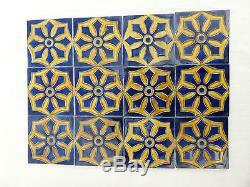 The item "ANTIQUE FRENCH TILES ARTS AND CRAFTS 1880 MADE BY BOULENGER SET OF 12 CARREAUX" is in sale since Friday, September 16, 2016. 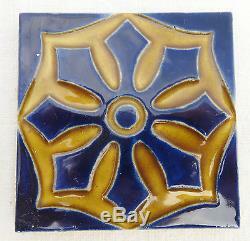 This item is in the category "Antiques\Architectural Antiques\Tiles". The seller is "brocante-de-france" and is located in Bordeaux. This item can be shipped worldwide.